In the fall of 1960, the writer John Steinbeck climbed into a pickup-camper that he’d named Rocinante, after Don Quixote’s horse, and started driving. He left his home on Long Island with a set of questions that could, he wrote, be lumped into a single one: "What are Americans like today?" With his poodle Charley by his side, the novelist traveled 10,000 miles in three months, making a loop from one coast to the other and back again. His account of the journey, Travels with Charley, was published in 1962, the same year Steinbeck won the Nobel Prize for Literature. Perhaps even more than Steinbeck could grasp at the time, the United States was at a turning point. He drove along an historical seam between one era and another, one kind of country and another. Half a century later, it seems fair to say that America finds itself at another crossroads. 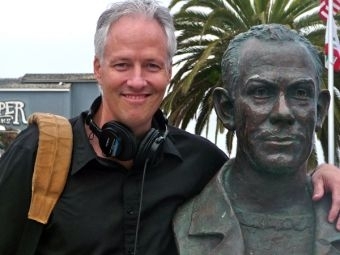 Travels with Mike retraces Steinbeck’s steps, not with a poodle but with a stereo microphone (i.e., Mike). Producer John Biewen went to key locations on Steinbeck’s itinerary and in each place collaborated with an artist who’s deeply grounded in that place. Travels with Mike comprises a series of conversations, across time, between a great American writer of the last century and a diverse array of contemporary artists – conversations about issues, place, and the spirit of the country. Listen Monday evening at 7 for this special program on VPR. Join Steve Delaney and David Moats for coverage of Vermont’s town Meeting Day and Presidential Primary Tuesday, March 4th at 7:00pm on VPR. Click here to listen to "The Town Meeting Tradition", an audio slide show narrated by Steve Delaney.